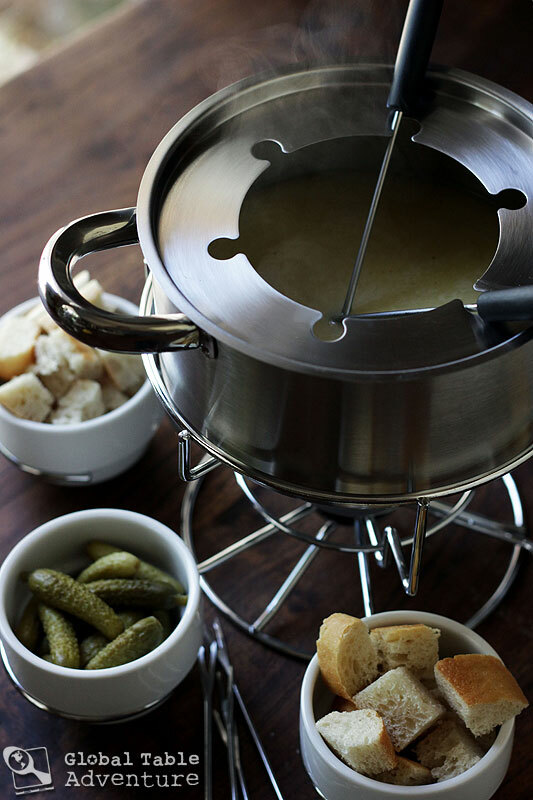 If I had to face life or death, I’d choose Swiss Fondue. This decision is purely based on personal experience. A) I know that life gets better whenever I dunk hunks of rustic bread into ooey-gooey cheese. B) If I’m faced with death, I’m willing to bet that, if I crack open a pot of fondue, Mr. Death would certainly realize they are no match for boozy cheese. I’d like to think that, as he slunk away, I’d toss him a cube of cheesy bread for the road. A peace offering of sorts. 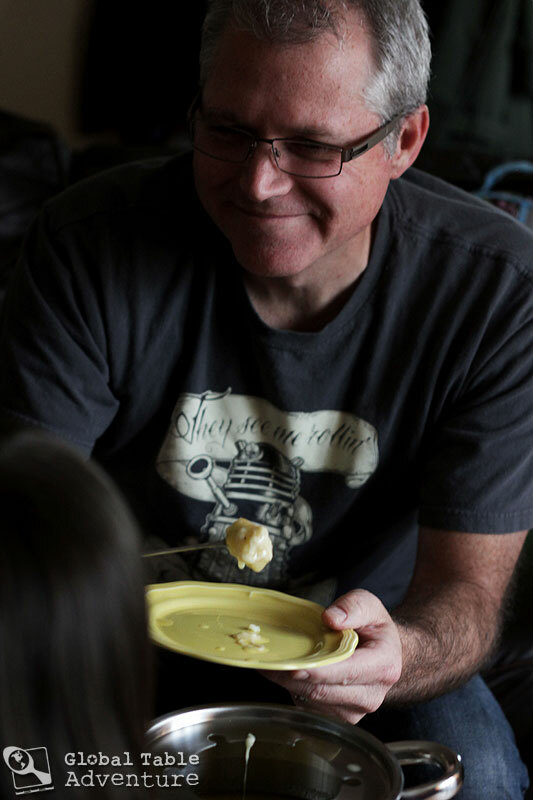 Two days ago I wrote about my near death experience in the Swiss Alps and how Fondue is one of the few comfort foods that can bring a person back from the shock of such an event. 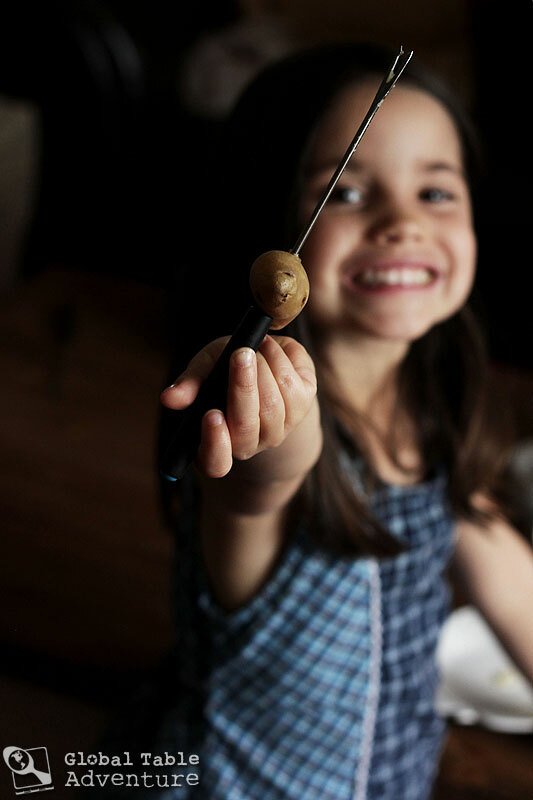 There are many ways to make fondue, but today I’m showing you a basic Neuchâteloise recipe that takes just a few minutes to pull together. The only requirements are a good quality dry white wine, plus a 50/50 blend of Emmental and Gruyere cheese. Feel free to serve it up with bread, gherkins, steamed veggies, pickled carrots, pickled cauliflower, boiled fingerling potatoes … you name it. There are just a few points of etiquette. [dropshadowbox align=”center” effect=”lifted-both” width=”575px” height=”” background_color=”#ffffff” border_width=”1″ border_color=”#dddddd” ]No Double Dipping The food should be cut small enough so that no one has to double dip. Because, let’s be honest, double dipping is gross when in polite company (if it’s just you and your husband? Go for it!). No Eating off your Fork Unless you’re with close family, don’t eat off your long fork. It’s the same as double dipping. The fork should only be used to transfer the cheesy food to your plate. From there, you can pick it up with a regular fork. 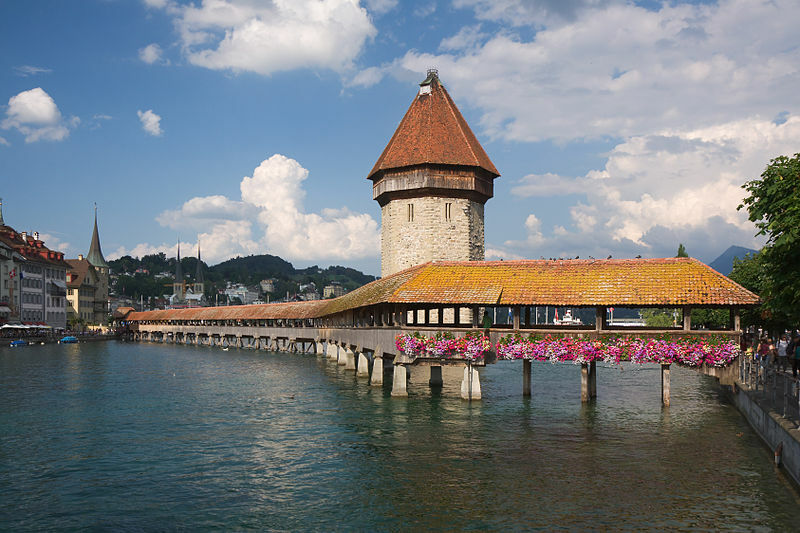 Kapellbrücke, Lucerne. Photo by Eigenes Bild. For starters, rub a small, heavy bottomed pot with the cut end of raw garlic. 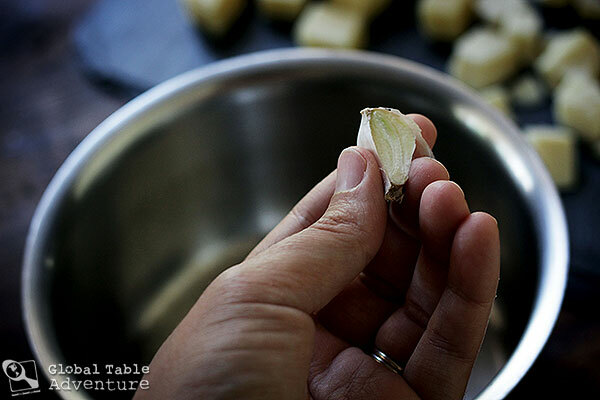 This will help infuse the faint aroma of garlic into the fondue, making the whole pot sing. Next, pour in the wine and heat it up until a few bubbles just begin to break the surface. Whisk a little wine into the cornstarch to make a smooth slurry and whisk it back into the pot. At this point, add the cheese. As with most things in life, the key is to use great cheese, so don’t skimp here. I used a traditional Swiss blend of Gruyere which is nutty and somewhat sharp, and Emmentalier, which leans more towards the milder side of things. Cube it up. The smaller the cubes, the quicker it melts. You can also shred it, if you have the patience; this does help it melt into the wine fastest of all. Keep the heat low, and continue stirring until all the cheese melts in and the mixture thickens. For cubes, this can take ten minutes. Then stir in the nutmeg, salt, and pepper, to taste. Keep the cheese warm, over low heat, or add it to the “caquelon” part of a fondue set (the pot). Enjoy on a rainy day. With smiles on your mouth and heart. [dropshadowbox align=”none” effect=”lifted-both” width=”575px” height=”” background_color=”#ffffff” border_width=”1″ border_color=”#dddddd” ]P.S. 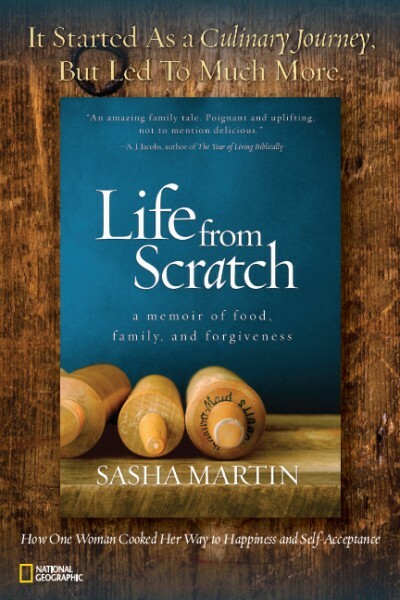 Because I love you… This week, I’m doing a special Facebook Giveaway. 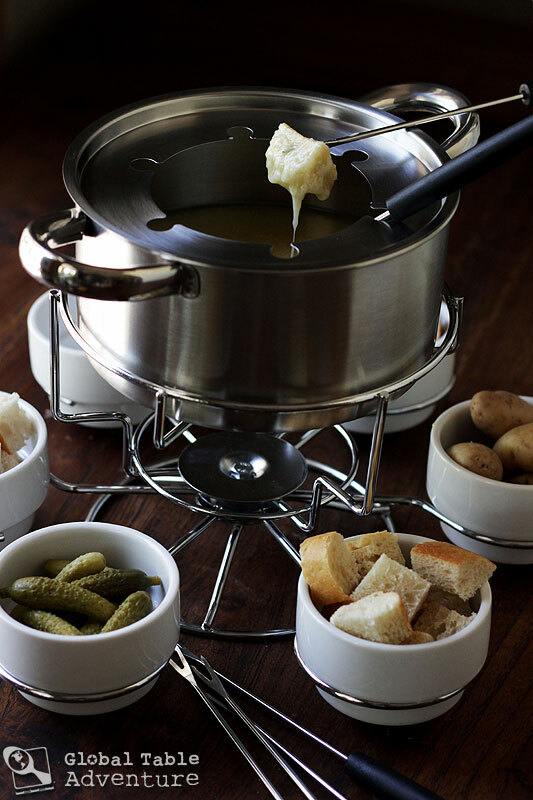 Check our Facebook Fan Page this Friday morning for a chance to win the same fondue set I used here. A winner will be announced on Facebook on Monday. For every Tweet you tag #myGTA, you’ll get an extra entry. 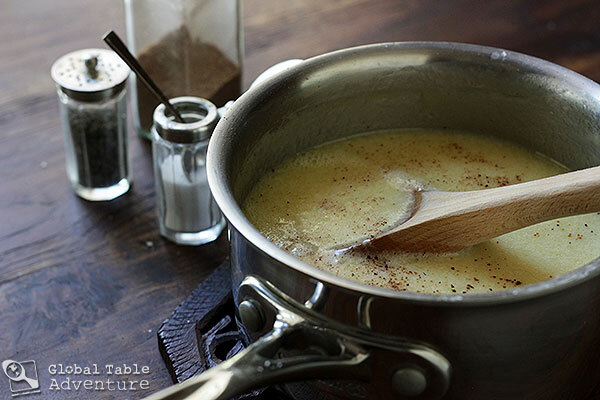 There are many ways to make fondue, but today I'm showing you a basic Neuchâteloise recipe that takes just a few minutes to pull together. 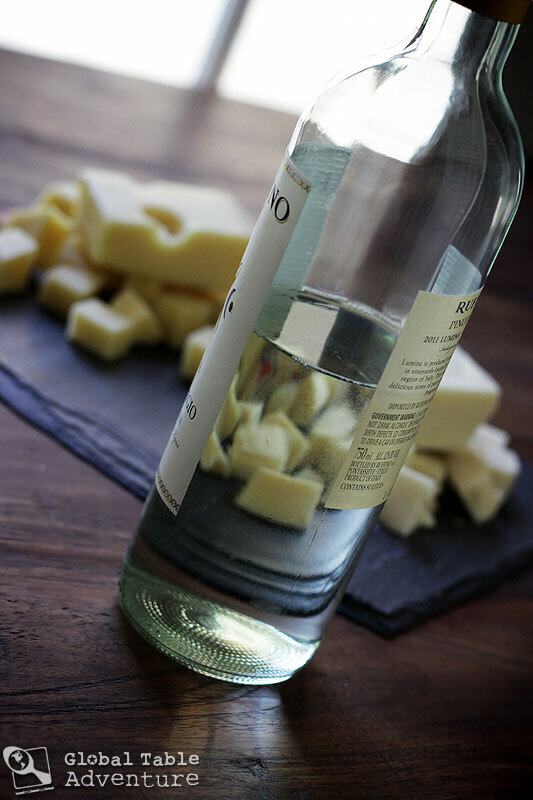 The only requirements are a good quality dry white wine, plus a 50/50 blend of Emmentalier and Gruyere cheese. Feel free to serve it up with bread, gherkins, steamed veggies, pickled carrots, pickled cauliflower, boiled fingerling potatoes ... you name it. Rub a small, heavy bottomed pot with the cut end of raw garlic. Pour in the wine and heat it up until a few bubbles just begin to break the surface. 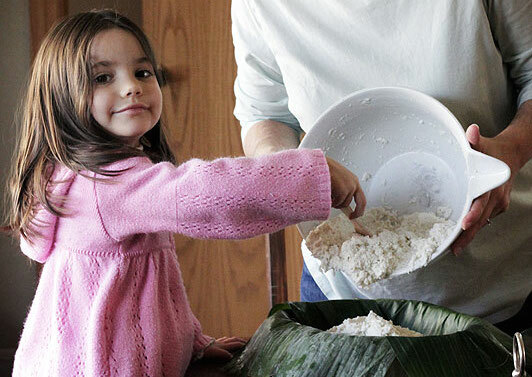 Whisk a little wine into the cornstarch to make a smooth slurry and whisk it back into the pot. Keep the cheese warm, over low heat, or add it to the "caquelon" part of a fondue set (the pot). I fondly remember foundue dinners from my childhood (back in the wild and wooly 70’s). My brother and I always loved those nights. 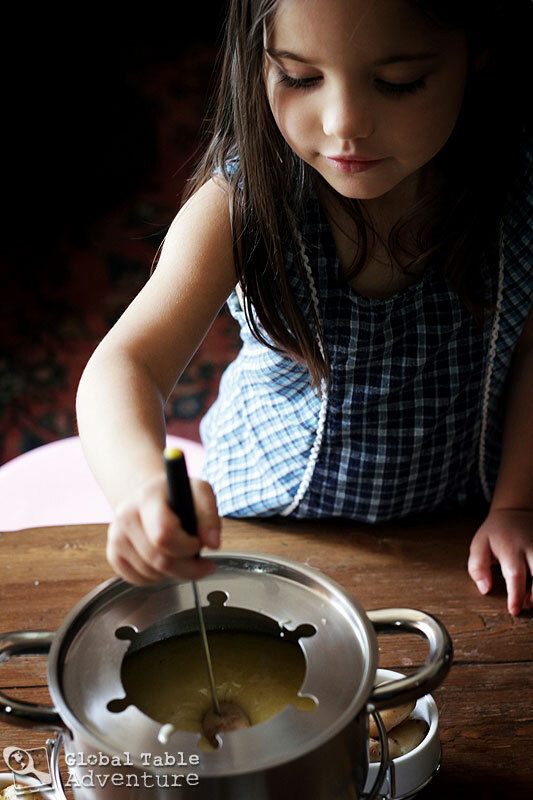 We did cheese fondue sometimes but often times we had the fondue pot filled with simmering oil and we cooked out our meats and other tidbits in the pot. So much fun! Great column. I want you to know that reading your global table adventures is one of the bright spots in my daily routine. I know you can’t keep it up forever–all good things end at some date–but while you continue to write, I’ll continue to read. Many thanks. Ah yes, I remember the late ’60s-early ’70s, when a fondue pot was a must-receive gift at bridal showers. 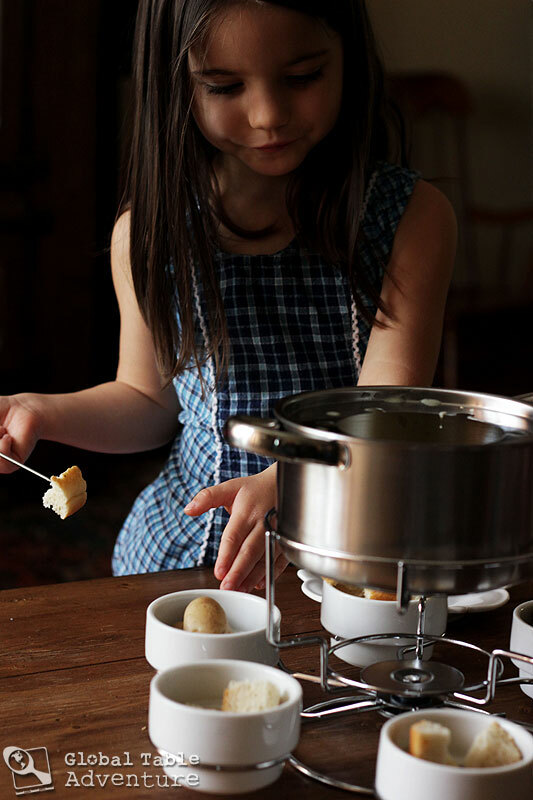 And AnnaClarice reminded me of my use of the fondue pot for tiny frying, too. 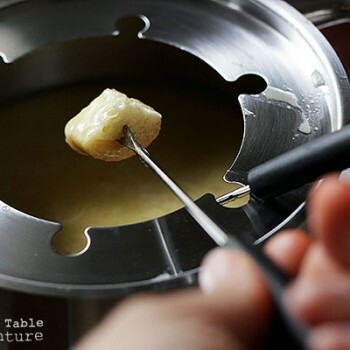 Thanks for this recipe for genuine cheese fondue! Raclette might be my favorite, but it seems like the equipment is more complicated to pull off. Hope you had a great mother’s day! One of my favourite cakes. Luckily I live in the German Southwest where Rüblikuchen often is served in cafeterias and coffeeshops. 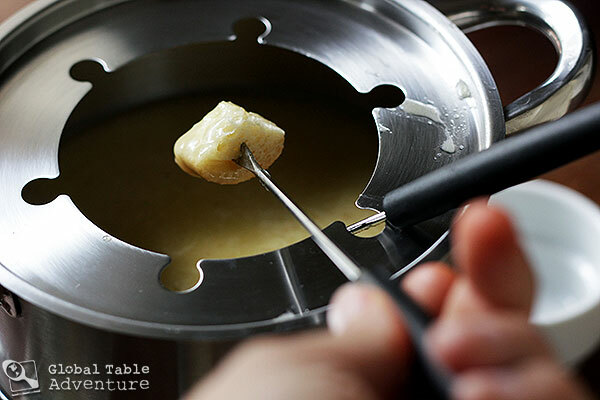 What I loved most about this blogpost is your description of the RULES OF FONDUE. The description starts on page 16 of the slideshow / page 19 of the book. Hi…well I have enjoyed reading few of your receipts and as a little swiss I have stopped by my small tiny country…here is a little tip to your receipt to avoid if it ever happened the chewy effect of the cheese, add like the cap of a warm alcohol such as cognac, armagnac or whiskey it helps with digestion as well avoid cold alcohol like Kirsch…maybe you’ll be tempted to try the fondue à la tomate it is with cheese but tomato home made sauce added to the cheese eaten with potatoes…it is really nice ! Also about the raclette, here is a thing where you don’t need special material and a farmer way/traditional to do it. 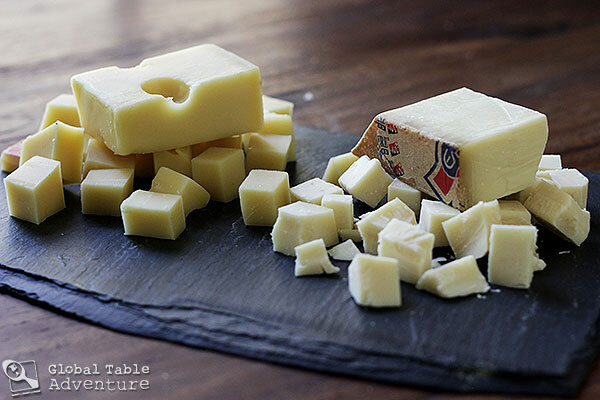 You need to have the half or quarter wheel of the cheese, a wooden board on which you put foil around it and a fireplace inside or outside…board close to heat it melts a bit and then scrape it onto the dish, used to do this while camping !!! 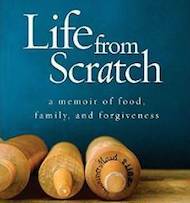 Seriously loved what you have done and the discoveries and opening mind you brought to your daughter, this is fantastic…keep up this wonderful way of approaching life and cultures, so rare nowadays !! !